In parallel with the research data shared service, we are running an initiative with researchers from the pilot institutions, also known as ‘The Research Data Champions’. These are all the most brave researchers that are not only taking care of their data, but are also showing others how to do it properly. 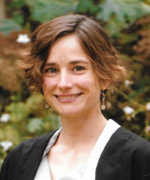 Annemarie Eckes is one of them, and she wrote a blog last year on data in environmental sciences. Below, she shares her experience in running a workshop on research data and metadata for PhD students. Is your data getting lost in translation? Feeling Lost in getting started on data management? On the 4th of December, we held a two-hour hands-on workshop on data management at the Department of Geography. Attendance was low, but the PhD students and Post Docs who attended (mostly from physical geography) enjoyed it and were very engaged. Does this sound like a trivial point? Everyone’s already doing it, right? Imagine that you suddenly lost your computer, or it broke, could you work? or would you be forced to take a holiday? Would your work be set back much? (for example, some solutions take more frequent snap shots) What if you moved to another position and lost your access to your institution’s server, what would happen then? Nevertheless, when new to the Department, it is important to learn about access and what services are available. Everyone wants to have a nice and tidy digital files on their computer. But, nobody (except, to my continual jealousy, from my fiancé) manages to keep things organised. But it is not as easy as tidying your room, as you are not constantly exposed to the mess. There are a few things that can help a lot in this process, like getting inspired by recommended file naming conventions and taking on board things you think are useful to you ( e.g. https://www.data.cam.ac.uk/files/gdl_tilsdocnaming_v1_20090612.pdf). I wanted to have ” the perfect” example folder structure and apply it to my PhD project. It seems to be a developing skill. I would have liked to have started with the example on this website, it would have helped me much more especially in the beginning. Also important are little messages to your future self and others (READMEs) on what this folder contains, how the files relate to each other, even just a few links on where you got the data from that this data contains. Or did you collect it yourself using XY and Z’s protocol or your own protocol, stored in//this/folder/ .? Needless to say: If you don’t have to collect it, don’t. There are plenty of unselfish reasons for sharing your data. A lot of the scientific knowledge we trust remains unchecked (follow @PolSciReplicate to learn more). We are in a reproducibility crisis. One more reason to share all of your data with the scientific community in order to reproduce and check existing results (also quite a selfish reason one might argue). Sharing is only half the story of course. It needs to be made FAIR as well, and one important aspect of that is the proper description of the data by use of “meta” data. However, if those don’t convince you, there are also “selfish” reasons covered in this very good article by Florian Markowetz. Want to learn about metadata in a fun way? Play with LEGO! The groups built little objects with LEGO, then had to describe their LEGO object. This description was then passed on to a different group, which tried to rebuild the LEGO figure, purely based on descriptions. 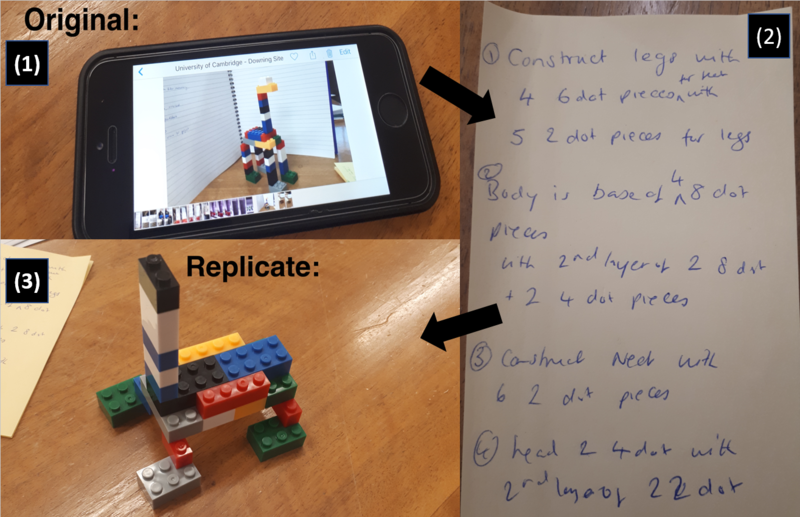 You can see how successful one group was in replicating the LEGO object (see fig 1). Now imagine this is how you described your data! Other issues are the handwriting – when something is digitalised, it is much easier to write. Some people had problems with the definition of words (e.g. “What does ‘axial’ mean?”). This can be easily described when your description is also linked with definitions, or ontology terms, so that we can be sure we agree on the definition that is used for that particular exercise. We finished with a data management new year resolution exercise: Everyone wrote their own data management new year resolution on a piece of paper, to their future self for next year. This will be mailed to the participants next year. We hope that all their RDM-resolutions will come true! 1) Original object built with LEGO built by one group, 2) The group’s description of the LEGO object . 3) This description was then passed on to a different group, the replicate object is built purely based on the descriptions.